Calcium hydroxide is an inorganic compound that is available in the form of a white odorless powder. It can mix with water (in small amounts) to form an alkaline solution that can cause severe chemical burns. What is Calcium Hydroxide Poisoning? What are the Causes of Calcium Hydroxide Poisoning? It is available in the form of industrial solvents and cleaners, cement, lime mortar and plaster, limewater, etc. What are the Signs and Symptoms of Calcium Hydroxide Poisoning? The signs and symptoms of Calcium Hydroxide Poisoning can vary from one individual to another. It may be mild in some and severe in others. Several systems of the body may be affected. How is First Aid administered for Calcium Hydroxide Poisoning? Who should administer First Aid for Calcium Hydroxide Poisoning? 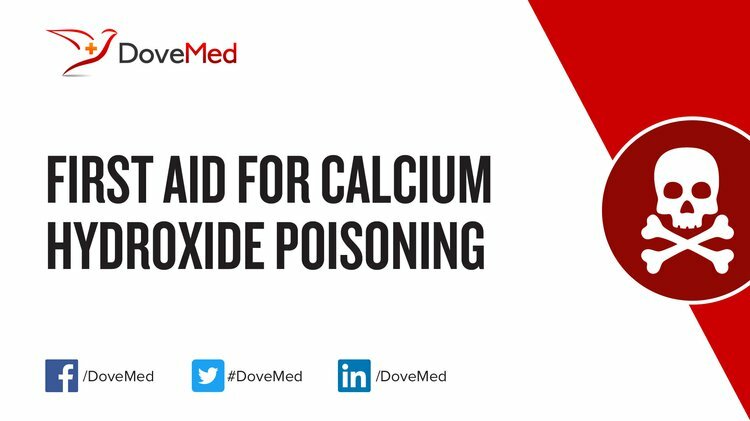 First aid for Calcium Hydroxide Poisoning is administered by healthcare professionals. What is the Prognosis of Calcium Hydroxide Poisoning? How can Calcium Hydroxide Poisoning be Prevented? Chen, B., Qu, R., Shi, J., Li, D., Wei, Z., Yang, X., & Wang, Z. (2011). Heavy metal and phosphorus removal from waters by optimizing use of calcium hydroxide and risk assessment. Environment and Pollution, 1(1), 38. Zhou, Z. J., Hu, Q. J., Liu, X., Yu, G. S., & Wang, F. C. (2012). Effect of iron species and calcium hydroxide on high-sulfur petroleum coke CO2 gasification. Energy & Fuels, 26(3), 1489-1495.
da Cunha, A. L. C., Lemos, M. S., Meth, S., Gonçalves, J. P., & Dweck, J. (2011). A study of the particle size effect on the pozzolanic activity of an equilibrium catalyst. Journal of thermal analysis and calorimetry, 106(3), 805-809. Santhosh, P., & Sridevi, A. (2013). A lab-scale study on reduction of heavy metals from electroplating effluent using conventional chemical precipitation. Journal of Environmental Research and Development, 8(1), 102. Al Mamun, M. R., Karim, M. R., Rahman, M. M., Asiri, A. M., & Torii, S. (2016). Methane enrichment of biogas by carbon dioxide fixation with calcium hydroxide and activated carbon. Journal of the Taiwan Institute of Chemical Engineers, 58, 476-481. Kannan, A., Rama, V., Sastry, B., Agrawal, D. K., & Kumar, A. (2013). Effect of feeding of calcium hydroxide-treated or vitamin E-supplemented cottonseed meal on plasma gossypol levels, blood parameters, and performance of Bikaneri lambs. Tropical animal health and production, 45(6), 1289. Gallucci, E., & Scrivener, K. (2007). Crystallisation of calcium hydroxide in early age model and ordinary cementitious systems. Cement and Concrete Research, 37(4), 492-501. De Oliveira, A. S., Campos, J. M. S., Oliveira, M. R. C., Brito, A. F., Valadares Filho, S. C., Detmann, E., ... & Machado, O. L. T. (2010). Nutrient digestibility, nitrogen metabolism and hepatic function of sheep fed diets containing solvent or expeller castorseed meal treated with calcium hydroxide. Animal Feed Science and Technology, 158(1), 15-28.